more tofu please: Sharing the love of tofu with non-vegans! I'm not too outspoken, in fact I think I might have the quietest voice in Omaha. I'm also not the vegan police. However, this doesn't stop me from sharing my love of delicious [vegan] food with others! Especially when I get to share it with someone who isn't vegan and has never tried tofu. In this case, I've told my friend Erin I would cook for her anytime. One of my favorite recipes comes from Vegan Brunch. No, I've never tried the omelets. I'm still stuck on the Tofu Bennys! I love hashbrowns and home fries, so I haven't tried making the english muffins. For breakfast, a Tofu Benny on its own will fill me up. For dinner, I wanted more. I'm greedy. I had my friend pick out another recipe from Vegan Brunch. Miraculously, I had everything to make the Pumpkin French Toast. To this wonderful pair, I made us soy lattes. Every morning, I made 4 cups of coffee (this is only two servings for me). I enjoy one serving hot with Silk soy creamer and store the other serving in a quart-sized mason jar in the fridge. When I need a pick-me-up or to impress someone, I make a cold soy latte using one of those protein shake containers. I use a 3:1 ratio of coffee to creamer, add the lid, and shake, shake, shake. This mixes and adds froth! Verdict: Amazing! We have another tofu-lover in the world! i can't believe i still haven't bought Vegan Brunch! i think i'm gonna have to request it for christmas or something. 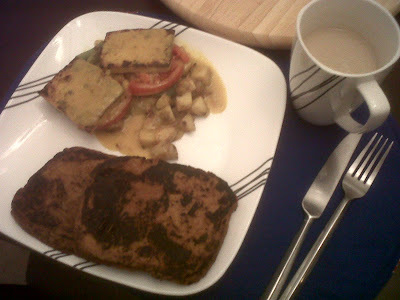 the tofu bennys look great, and so does the pumpkin french toast. mmmmmmm! nothing like spreading the vegan love with friends - especially because some people think that vegan food isn't very tasty. makes me sad when they think that. it's so untrue! i really like your idea to shake up the latte to create some foamy fun. we totally have one of those protein shake containers and now's all i've gotta do is get more beans so we can make more coffee. we too keep iced coffee in mason jars 'cause plastic kinda creeps me out. thanks for the awesome tip on making foamy lattes! Jessy - You need Vegan Brunch! seriously! It is my go-to-book for all breakfast needs (which usually happens during dinnertime). I know I'm not really making too many protein shakes anymore. I got the idea after reading that soymilk makes great foam for lattes. I thought about adding protein powder to my coffee latte but I haven't yet. Of.Varied.Interests - I need to try out the red fennel hash! I love, love, love the sausages (all varieties). I'm so glad you found my blog! I really like your blog - definitely making soup this week!